Having switched my website to Ghost running on Docker a while back, I'm definitely a convert. It has made the administration of my website significantly easier, but I was missing one thing: Commenting. So I set out to find the simplest self hosted solution for commenting. It came down to either Discourse or Talk. Looking at both solutions, I ultimately decided to go with Talk, as Discourse is a significantly larger tool, really more focused around building a community and forum - not just commenting. With my entire site running on Docker, why not run Talk on Docker too. Good news is that there is a step by step guide on the Talk project site. As I already configured Lets Encrypt wildcard certificates on nGinx, it was simply a matter of adding a upstream element and 2 new server sections, one for HTTP and another for HTTPS. That's it. Simply restart your nginx server and you're good to go! Now that everything is up and running, it's time for you to go to your configured website and go through the web configuration. This will set up your account as well as allow you to configure Talk itself. On to the last step. 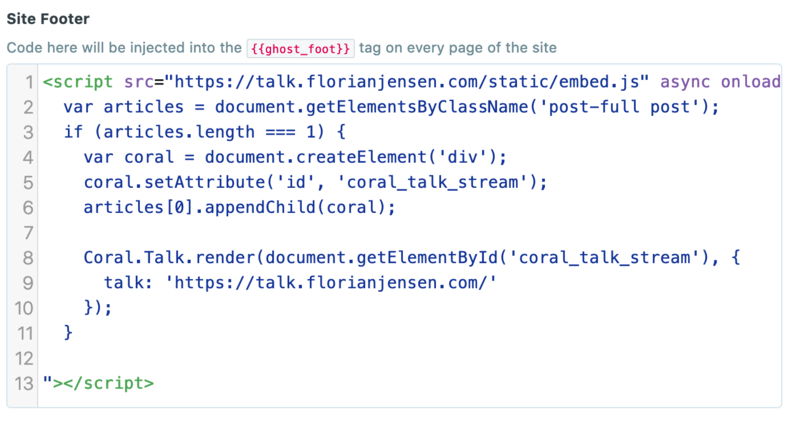 There are a few ways to integrate Talk into Ghost. However, most of them require you to modify the theme. Now, one of the big advantages of running Ghost on Docker is that you can have it automatically update the theme along your Ghost install itself. As such, manually modifying the theme isn't the best idea. Just hit save and you're good to go! You should be seeing posts show up in Talk and the comments section showing up on your blog. That's it! You can see the comments in action below, so feel free to leave a comment.